This is a nice photo of a diamniotic/dichorionic placenta, part of a pregnancy involving two separate embryos in the same uterus. Note the thick intervening membrane and lack of blood vessels traveling between the two placental discs, both characteristic of a di/di placenta. Fascinating! Thank you for posting. Just out of curiosity, are twin placentas always joined, even di/di placentas? Technically di/di placentas are separate, but they are always adherent to each other. Beautiful. I hope I can get to see such things in person too. 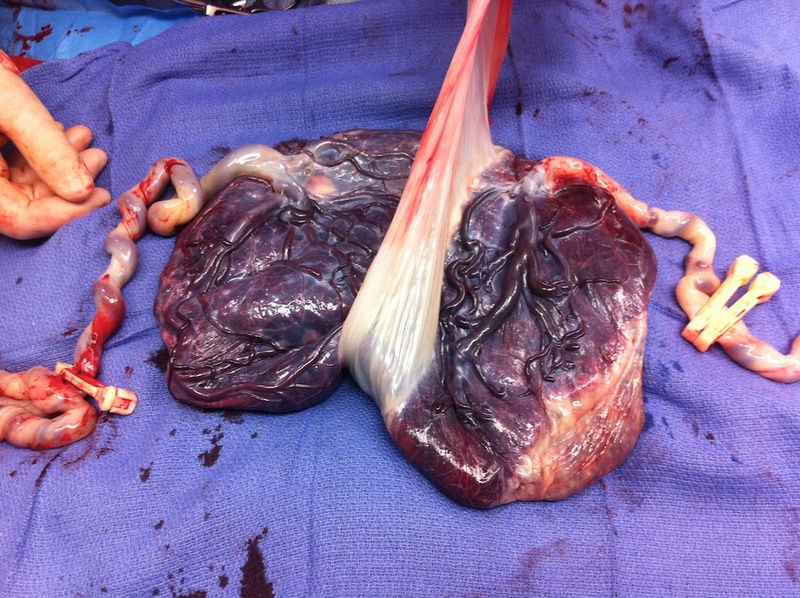 That is a beautiful pair of placentas! Can you please explain your “Always adherent to each other” comment? Chorionicity defines the risk of a twin or HOM gestation. I don’t see anything else regarding twins & their placentation here on this site.